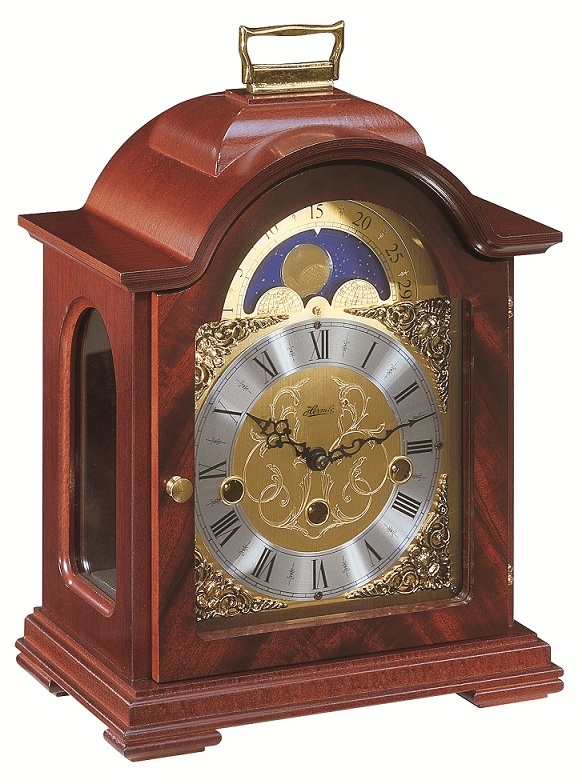 The Debden Mahogany Mechanical Hermle Mantel Clock is crafted with a shouldered arch mantle in an elaborate mahogany finished wood case along with pyramid mahogany veneer styling. With a side glass and hinged back door, intricate details of the mechanical workings of this piece can be viewed from any angle. Clock face displays Roman numerals, along with an etched Moon phase feature. The mechanical brass 8-day key wound movement plays a 4/4 Westminster chime. Mechanical movement inside the clock insure precision timing with minimal set up and maintenance. Easily portable, this piece will fit on any mantle or shelf with at least 6'' of depth clearance.